Special occasions call for memorable reminders of the important day. 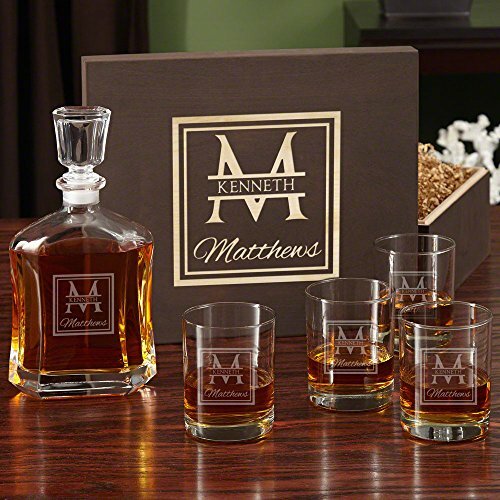 Celebrate your important landmarks with this beautiful whiskey gift set. 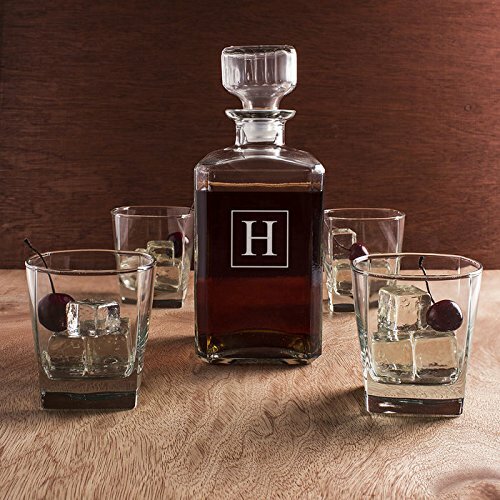 The perfect keepsake for any special occasion, this handsome gift set comes with four Eastham whiskey glasses and one Argos liquor decanter, all encased in our beautiful hand crafted maple gift box. All pieces are engraved with our sophisticated Oakhill design that features the first name, last name and initial of your choice. The walnut-stained maple box measures 13 x 11.5 x 5.5 . Premium quality Eastham whiskey glasses measure 4.5 tall and can hold 10 ounces. Custom decanter holds 23 ounces and measures 10.75 x 5 ..